Seeing another old building or castle may not sound appealing to kids, and it might be hard to wrap your head around a castle that was started in 1066, but when you talk about beheadings, getting married six times and starting your own church, things tend to get more interesting. Before we left, I read the TripAdvisor message boards and learned about the National Rail 241 offers. You need to go to a National Rail stop (there are many in London) and provide them with a small photo (about 1 1/2 inch square) and request a 1, 3 or 7-day travel card. They should also have a booklet of two-for-one offers, or you can search and orient them before your trip. I never had anyone check to see if we had the travelcards while using the offers. These travelcards also work on the London Underground. 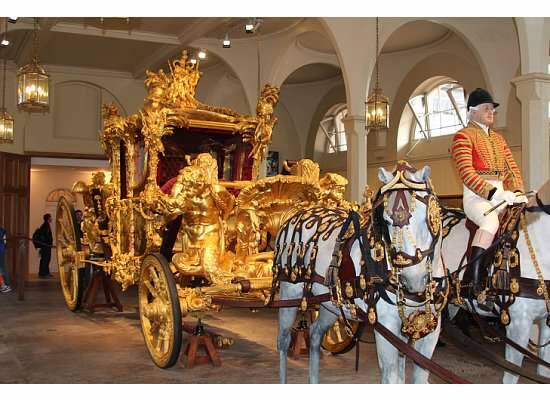 Royal Mews (241): because my daughter and I like horses, we toured the royal horses and carriages. It was fun to see the history, up to present day of the carriage that William and Kate used for their wedding. Buckingham Palace: it wasn’t open yet for summer but there were still crowds of people at the gates looking at the guards. We had a better photo opp down the street with some more guards. Nearby St. James Park is a great place to let the kids run and play for a bit. Ripleys Believe It or Not (241): part museum, part activities, it was a little overpriced but an OK way to spend the afternoon. The kids really liked the spinning tunnel and the laser obstacle course. Greenwich: we took a boat ride (241) on the Thames and I highly recommend it. It’s very relaxing and you can get some great photos of famous sites with a water view. In Greenwich, we had lunch, went to the Royal Observatory and straddled the Hemispheres at the International Dateline. We then played in the large park, walked by the Queen’s Castle and Cutty Sark before taking the boat back to London. 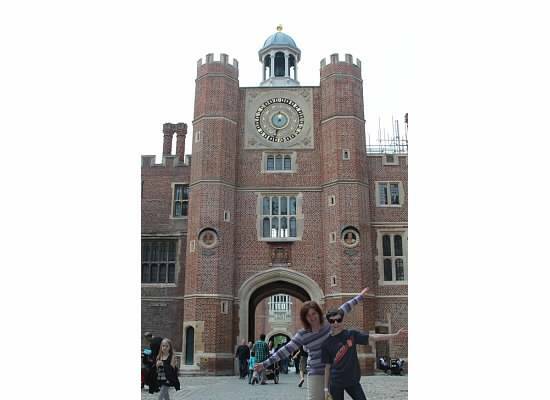 Hampton Court Palace (241): We took the Underground to a train station and took the National Rail to Hampton Court. The Palace and grounds are huge and you can spend a day wandering around. We got lost in the hedge maze, learned how they made chocolate and explored the rooms. We left the palace and crossed the street and had lunch at a restaurant on the river, then went back and explored some more. They have robes you can put on to become a member of the royalty and some quizzes for kids to find the answers as they tour the palace. 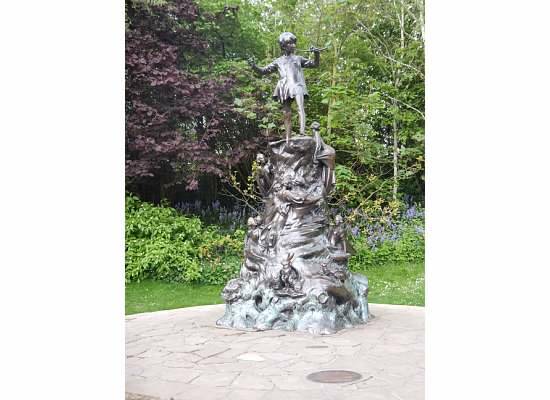 Hyde Park and Kensington Gardens: The Peter Pan statue is not well marked and it took quite a bit of wandering around to find it but it was well worth it to see where history was made. My kids had a great time letting off some steam, seeing some waterfowl on the water and running around in the grass. 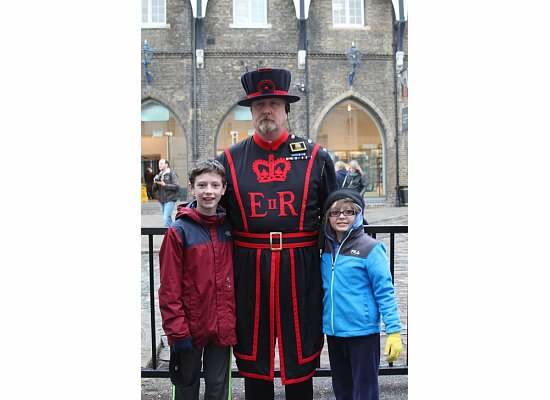 Tower of London (241): We altered my original itinerary because the website said the Tower would be very busy on Easter weekend and we were very glad that we did. 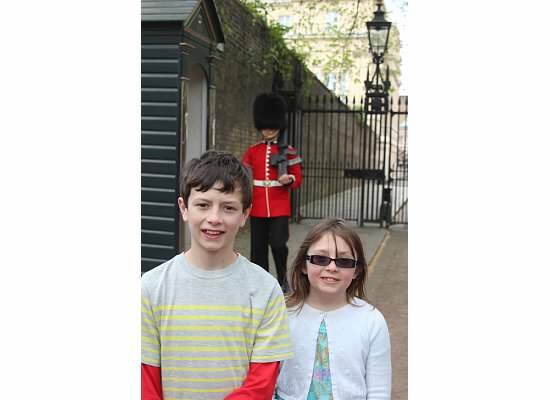 The Yeoman Warders were one of the highlights of the trip, and my kids remember the most about this day. 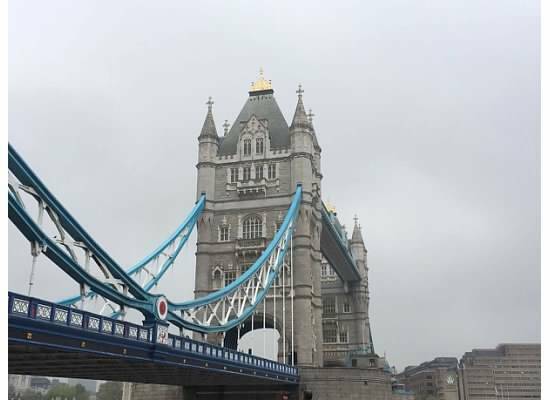 It was a fairly short line (under 20 minutes) to see the Crown Jewels, and my kids were intrigued with the torture devices, carvings of Tower prisoners and the former menagerie (zoo). 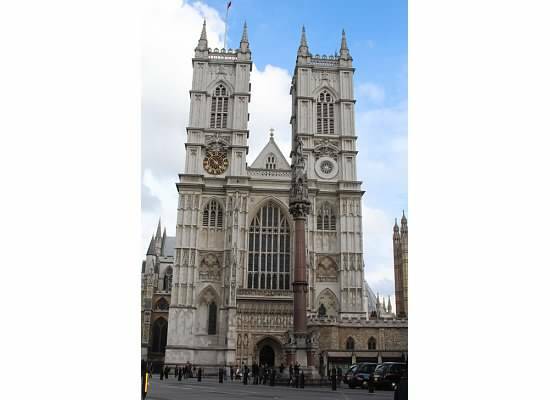 Westminster Abbey: We arrived fairly late in the day so we only toured a small portion. It’s amazing to think of how many ancient burials have taken place here. My daughter became more interested when I told her kings and queens are married and have coronation here. The science museum (241): It was raining so both museums had huge lines. We picked the shorter of the two. The museum was packed, but my kids liked the Imax movie and the children’s area. There were a few interesting exhibits but overall it was too crowded to enjoy. 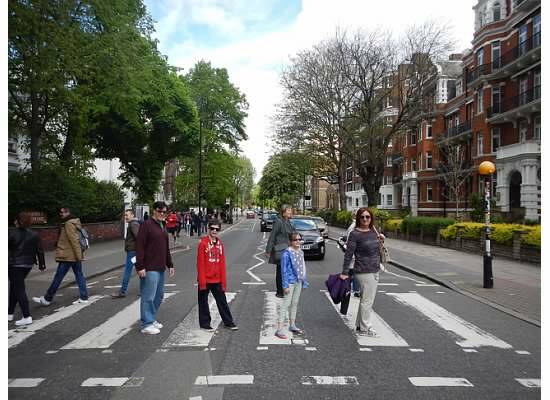 With a lot of research and pre-planning, we were able to see many sights and have once-in-a-lifetime experiences. It was extremely easy to have our children along with us, and my son learned the underground stops much faster than I did. 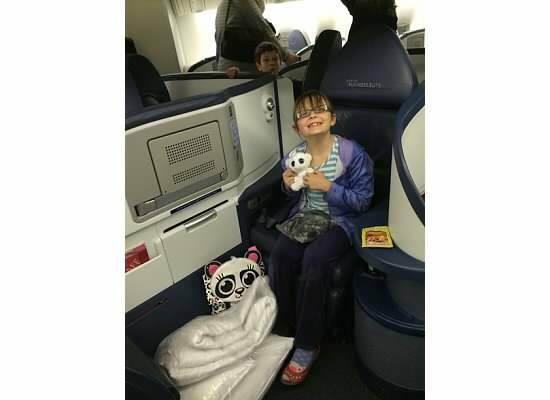 This was a trip of firsts – first time taking the kids overseas, first time using Airbnb and the first time flying business class on delta. All three experiences went off without any major issues and made our spring trip to Europe one to remember. We used Skymiles to book our trip over the Easter school break and I did it well in advance. I was surprised to find that business class on the redeye to London was only 2,500 miles more per person so we booked that without thinking twice! It was well worth it. 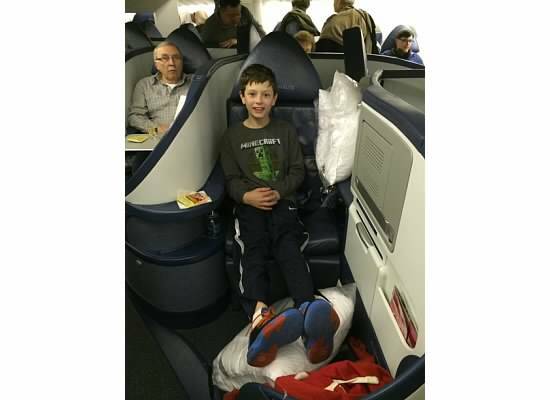 We were able to visit the sky club for snacks before the flight, and the kids were thrilled with the lie flat seats. Dinner was amazing, especially for an airline meal. Shrimp appetizer, salad, a main course and dessert. The kids thought some of the food was a little too fancy but the adults loved it. The business class seats also came with a travel pack with headphones, ear plugs, tissue, a comb and some other things you may need while traveling. I have to admit, the lay flat seats were a little strange while flying. I felt like I had to incline just a bit so I didn’t feel like I was sliding around. During dinner, the attendants come around and ask if you’d like to be woken up for breakfast, and then you place your breakfast order. We had a choice of omelettes or yogurt and granola. 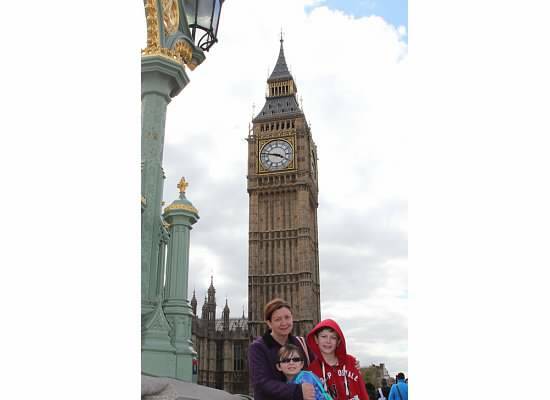 It was a smooth flight, the kids slept well and we were up and ready to explore London. Getting through London Heathrow was easy and we were able to find the underground and purchase our passes easily. The trains had plenty of room for luggage and it was a great way to se some of the countryside as we traveled to our rented flat in Earl’s Court. I’m glad I didn’t book a cab – it would have been a lot more expensive and we wouldn’t have had the time to figure out the train system.